The situation: One child with a fever over 103 and the other seemingly headed in the same direction. The challenge: Find quiet activities throughout the day to keep them interested and relatively still without the use of television. The project: Sensory Buckets. I can't remember which craft blog I found this idea on but I made a note of it for a day such as this one, knowing it would be something Patch and Madelyn would enjoy. 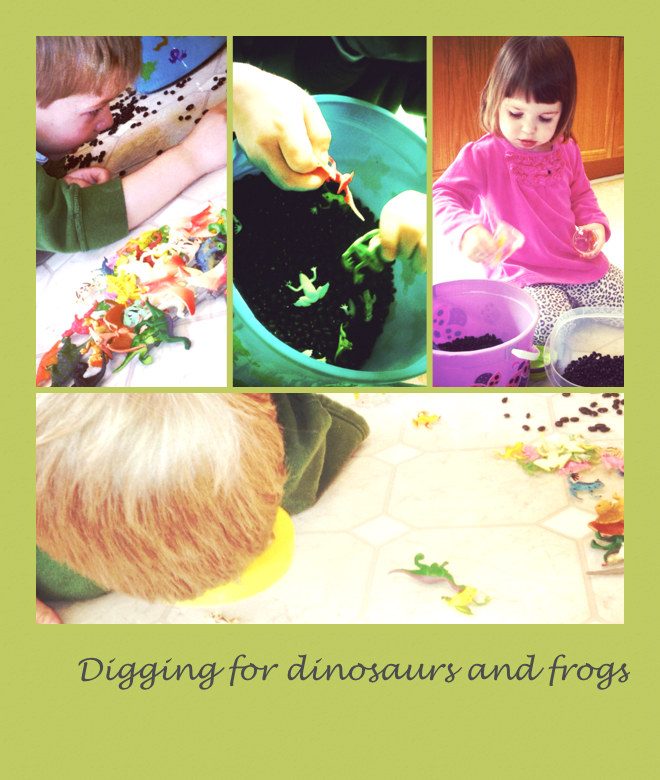 I filled two buckets with black beans and buried small dinosaurs and frogs in each one. The kids used their hands, small cups and measuring spoons to dig in their buckets to find the animals. Madelyn preferred to use a shot glass to scoop beans from one bucket to another, sorting animals as she found them. She lined them up neatly on the floor, counted them, then sorted them by which kind then by color. She made little families out of the group, the bigger ones were the Mommies and Daddies and the smaller ones were the babies. Patrick predominantly used his hands to find the dinos and frogs. He made a big pile on the floor and then when he was sure he had them all, began to sort, first by which type of animal. Then he pushed the frogs to the side and concentrated on the dinosaurs. He made three groups: quadrupeds, bipeds and ones that fly. Then he put the carnivores and herbivores in two separate piles, naming each one as he picked them up. He used the magnifying glass to study each of them and then would hand it to Maddy so she could look as well. They were very cute taking turns with the magnifying glass, squealing with excitement as they observed what the dinosaurs face or tail looked like up close. This is a favorite of ours. I did something very similar with beans, rice, and cous cous on rainy days last summer. I mean, Carson did the playing...mostly.